With such a variety of sunflowers (Helianthus) available these are wonderful plants to add some exotic colour to the garden. Children love them and although the taller and giant varieties are popular many of the colorful and dwarf cultivars are well worth exploring. Sunflowers are a plant that can readily be grown from seed in the home garden and seed is for sale from many online suppliers. Giant sunflower seeds are popular with home gardeners. Helianthus seeds or ‘Sunflower Seeds’ should be sown directly into the ground where you want them to grow, we do not recommend transplanting seedlings. The common flower colour is the familiar yellow, however, pale yellow, orange, pink, red, and white sunflowers are also available. And yes you can get double flowering varieties as well. Not to mention different colour centres. You are best to grow most sunflowers from seed, as they do not transplant that well. You will also find greater variety this way. After you have browsed the online catalogues and ordered your seeds you need to find a sunny position in the garden and prepare the soil. A humus rich well drained soil in a position protected from strong winds is best. Choose an area that has some protection from wind if possible. Dig the area over and plant seeds to a depth of 12 cm. Water in well and keep moist until germination. Keep the area free from weeds and fertilise with a liquid seaweed fertiliser or similar. Harvesting your own seeds means you need to separate the seed itself from the kernel. Give them a 1 second blitz in an electric mixer, this will break open the kernels. Separate by floating off the kernel shells in water. How tall will sunflowers grow ? – Up to 3m in height for the giant varieties, 1m for dwarf types and in between for the rest. Can you grow them in containers? – Yes, but only the dwarf varieties. 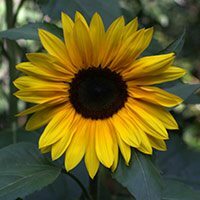 Can you harvest sunflower seeds from the garden ? – Yes it is simple, either leave the sunflowers to dry naturally on the plant, or consider covering the flower heads with a stocking or paper bag once the the flowers have set the seed. If in doubt as to when to harvest, the birds will tell you, however it may be just a little to late by then. How many seeds does a sunflower produce? – Over 1000 and up to 2000. Do sunflowers turn around? – Yes, they are heliotropic, the flowers turn to face the sun during the day.